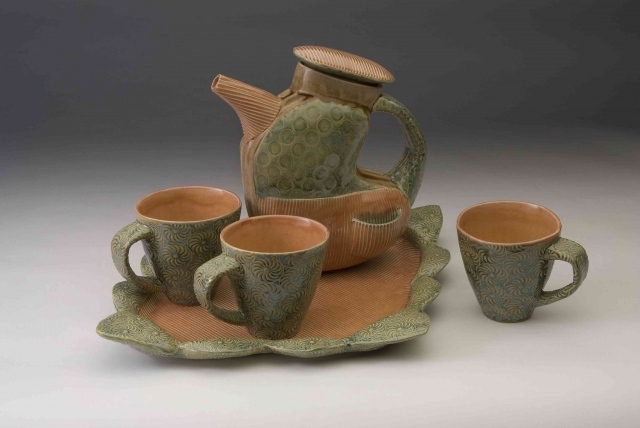 When I make sets of pots that are in-cahoots because of their individual roles in a specified routine, such as pouring, doctoring, and serving a cup of tea, they relate to each other visually. Take for example, Mother Hen. I used the elemental form that the mind reads as ‘bird.’ I then signified that implication with ball and claw feet. To develop her character, I put her in corduroy britches with a pants-pocket, and a polka-dot top, the outfit, I imagine, of a brilliant gardener (one of those earth mother types, you know). I sized her clutch of cups to come up to the top of her britches, mimicking the ratio of children to mother, or chicks to a mother hen. 13" x 17" x 13"